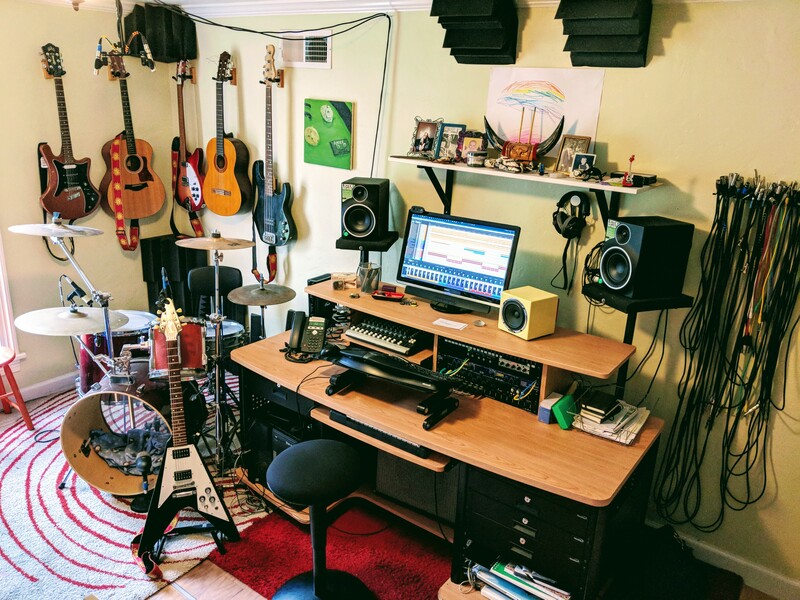 After having various nooks and corners set up in various apartments on both coasts, I was determined to set up a permanent recording space when we finally bought a house in San Francisco. I have accumulated the gear over time, and it ranges in quality from pretty bad to pretty decent. 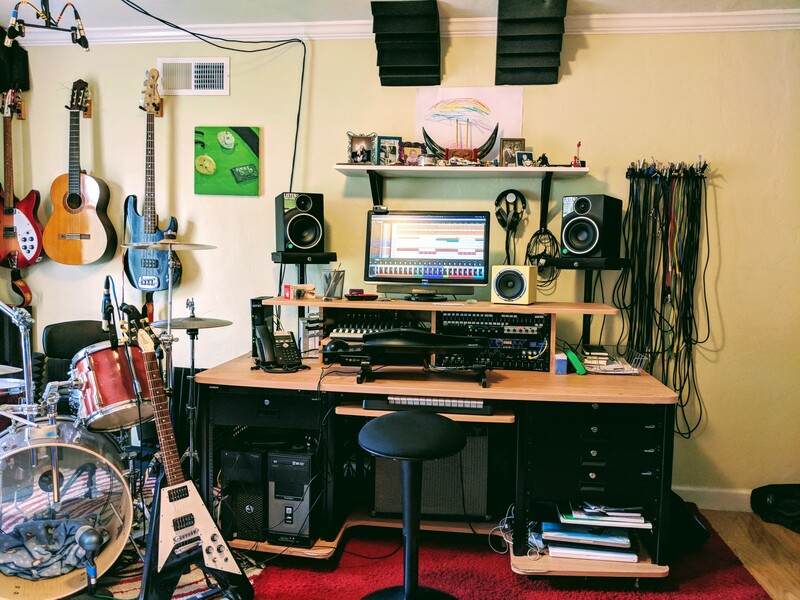 The two biggest advantages of my current space are 1) rarely having to set anything up when it's time to record (the exception being two additional mics I have to throw up for decent drum recordings) and 2) having a patch bay! Minimal sound treatment, but it seems to be working ok and my ear is finally adjusting to the room. There's also a pull out couch, a tall bookcase, and my wife's desk/office space on the other side of the room, all of which helps to absorb and/or disperse some echos. Also, after buying the house we discovered that the previous owner had put down the floor panels *over* a carpet, which seemed really weird/cheap, but for my purposes is probably helpful! Puts mine to shame, except I do have plenty of acoustic treatment. I too have a little Avantone which I love. Someone told me to place it off axis a little further away and it seems easier to work with since I moved it. 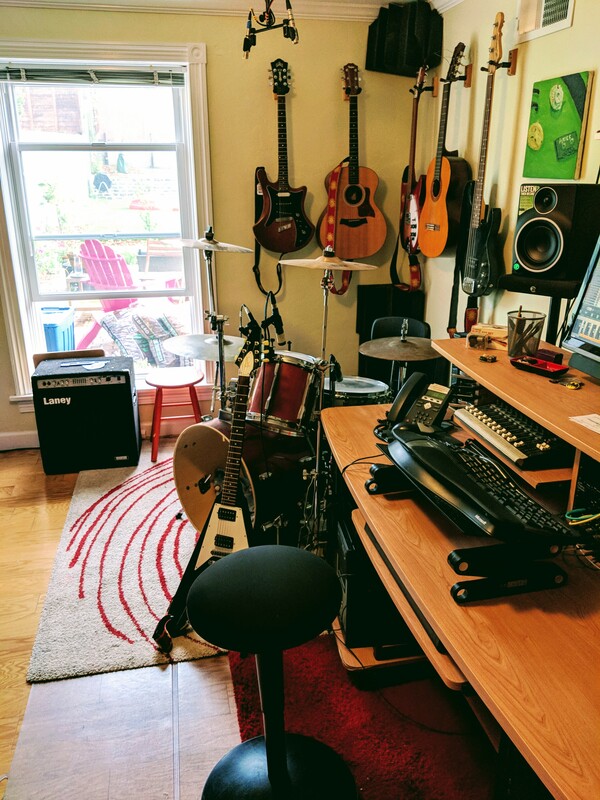 I'm hoping to add a bit more acoustic treatment at some point, but having to worry about aesthetics for my wife's office and the guest room aspect I have to be careful with what I throw up on the walls. My favorite part might be the art above the desk behind the bull horns. jaymz wrote: My favorite part might be the art above the desk behind the bull horns. lesmac wrote: I'm envious of your lead rack! I'm taking a wild guess - is that actually a tie rack?! Either way, now I know what to do with the tie rack I have... if I ever get a home studio set up. I own only a few ties... you know - for funerals and weddings - gotta hang onto my Jerry Garcia special! Good guess, but no, it is a legitimate cable rack with different width spaces for different size cables. It is definitely a lifesaver! Now you have no excuse, Les!